Today (1st October) the two English portals in GLR, UK English and US English, have been consolidated into one new English portal. All exam passes in both languages have been transferred to the new portal, and you’ll find that your GLR experience is otherwise unchanged. End of an era for us UK-Englishers! Take your exams (in English or one of the many other languages) here: https://getlicensingready.com. SPLA comes to GLR! If you’re already a fan of Get Licensing Ready then you’ll know that it’s a great way of testing your existing licensing knowledge as well as learning topics you’re less familiar with. 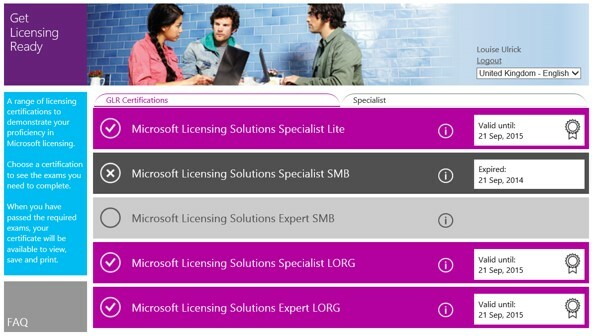 Now there are four new modules for the Services Provider License Agreement (SPLA), so if you need to get up to speed with how Microsoft licensing works under SPLA, then download the handouts, watch the videos, and get a tick in the box by passing the exams: http://getlicensingready.com. Get Licensing Ready Update: the Partner Quotes module is moved from the MLSS LORG level to a specialist track on its own. Check your licensing knowledge is up to date at https://getlicensingready.com. Some exciting updates to the Get Licensing Ready site! First of all, there’s a new track for you to demonstrate your proficiency in the Enterprise Cloud Suite with three exams to take and pass. Then there’s an overhaul of the whole look and feel of the site so that it’s easier to see what tracks are available and whether your certifications are still valid. Head off to https://getlicensingready.com to check you’re all up-to-date with your licensing knowledge. If you’re a fan of the Get Licensing Ready handouts – and who doesn’t love these one pagers on all aspects of Microsoft licensing?! – then you can get a preview of the new handouts for the Enterprise Cloud Suite. New exams will come to Get Licensing Ready soon, but the handouts are available here right now: http://bit.ly/GLRhandouts. The Virtualisation module has been removed from the Get Licensing Ready tracks. Are those GLR Elves mad?! No, there’s method in their madness – all of the virtualisation content is now incorporated into the various product modules where it should be – and thus there’s no need for this separate module any more. Don’t forget to keep your GLR certification up to date at: https://GetLicensingReady.com. The GLR Elves have been busy… Get Licensing Ready is a popular licensing exam site from Microsoft and it’s just been updated with amendments to exams in both the SMB and LORG tracks. The “Online Services and SPLA” exam has been retired and there’s no longer a requirement to take SMB exams in the LORG track and vice versa. Most notable though is the inclusion of an MPSA track which consists of three modules, the first of which has also been added to the MLSS LORG level. If you need a new certificate to hang on your office wall then head over to http://getlicensingready.com as quick as you can.